Antibiotic resistance is one of medicine's most pressing problems. Now, a team from Korea is tackling this in a unique way: using bacteria to fight bacteria. Before the discovery of penicillin in 1928, millions of lives were lost to relatively simple microbial infections. Since then, antibiotics have transformed modern medicine. The World Health Organization estimates that, on average, antibiotics add 20 years to each person's life. However, the overuse of antibiotics has put pressure on bacteria to evolve resistance against these drugs, leading to the emergence of untreatable superbugs. Now, researchers at South Korea's Ulsan National Institute of Science and Technology (UNIST) aim to fight fire with fire by launching predatory bacteria capable of attacking other bacteria without harming human cells. "Bacteria eating bacteria. How cool is that?" asks Professor Robert Mitchell, the team leader. He and his colleagues are also developing a natural compound called violacein to tackle Staphylococcus, a group of around 30 different bacteria known to cause skin infections, pneumonia and blood poisoning. 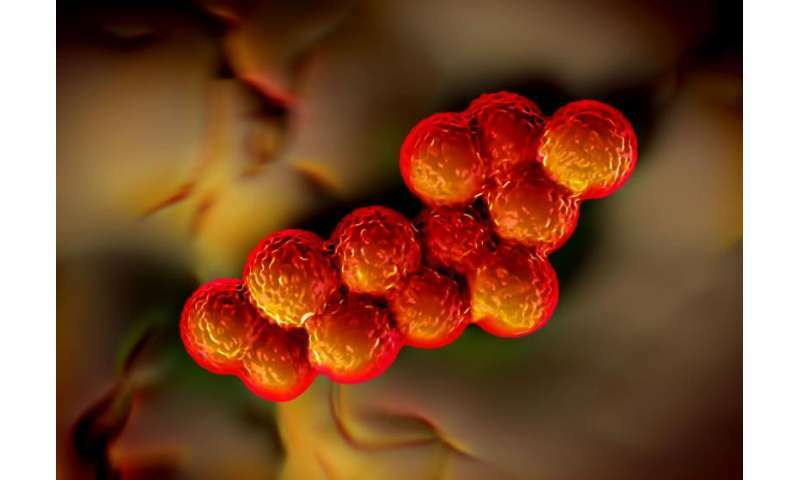 Some Staphylococcus bacteria such as MRSA (methicillin-resistant Staphylococcus aureus) are resistant to antibiotics, making infections harder to treat. Violacein is a so-called 'bisindole': a metabolite produced by bacteria from the condensation of two molecules of tryptophan (an essential amino acid used in many organisms to ensure normal functioning and avoid illness and death). This compound is vibrant purple in colour and of interest to researchers for its anticancer, antifungal and antiviral properties. Researchers have discovered that it can stop bacteria from reproducing, and even kill the multidrug resistant bacterium Staphylococcus aureus, when used in the right doses. It also works well in conjunction with other existing antibiotics. Mitchell and his team isolated a bacterial strain, called D. violaceinigra strain. NI28, from forest soil collected near Ulsan in South Korea. Using a technique called high performance liquid chromatography to separate and quantify compounds produced by the bacteria, they showed that strain N128 is capable of producing large quantities of crude violacein. They are now collaborating with fabric manufacturer Yeejoo Co., the Korea Institute of Ceramic Engineering and Technology, and research teams in Turkey and Romania to manufacture antibacterial fabrics infused with violacein that can effectively kill S. aureus. The team is also working on the predatory bacterium Bdellovibrio bacteriovorus. 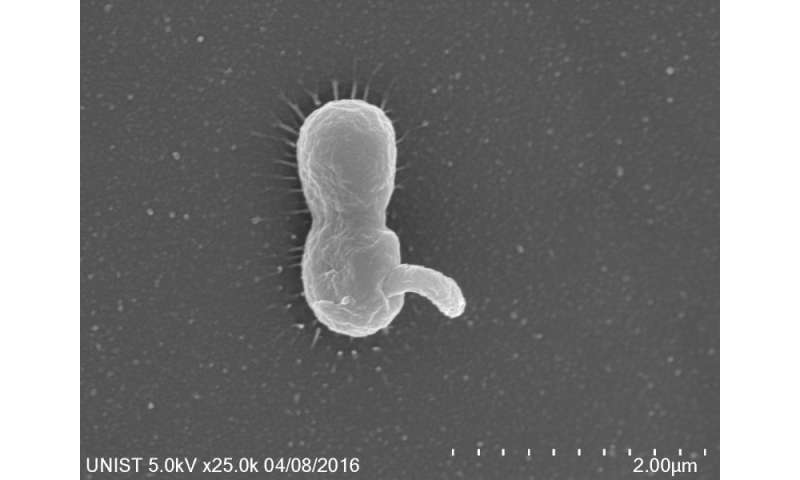 This is an obligate predator of bacteria, normally found in river water or soil. It attacks and enters the bacteria it must predate on to survive, growing and dividing repeatedly. Once inside, it eats the host from the inside out. When it has had its fill, it ruptures the host bacterium's cell membrane and exits, ready to attack the next bacterium. Previous research showed that B. bacteriovorus does not harm human cells and can attack over 100 different bacterial pathogens. The researchers examined how the predatory ability of B. bacteriovorus was affected by indole, a well-known metabolite produced by E. coli and many other bacteria. Indole regulates various biological functions in bacteria, for example regulating the stability of small DNA molecules, as well as functioning as a signalling molecule, which different communities of bacteria use to 'talk' and coordinate gene expression within a population. The researchers tested the predatory ability of B. bacteriovorus by setting up a bacterial version of a gladiator contest in flasks. They put various bacteria face to face with B. bacteriovorus and then artificially added different concentrations of indole and examined how this affected B. bacteriovorus' predatory behaviour. They found that B. bacteriovorus takes much longer to attack E. coli—a common bacterial strain that can cause food poisoning, infections and fever—in the presence of indole. To make sure the predator-prey relationship was not influenced by E. coli's own production of indole, they also tested the predatory ability of B. bacteriovorus on another food poison-causing bacterium called Salmonella, which does not produce indole. The result was the same: in high concentrations, indole even blocks and prevents the predatory bacteria from attacking altogether.